This article describes the main features and properties of the RadDiagramToolbox control. You can examine the behavior of the control in the Diagrams DesignToolbox demo. The Diagram Extensions include a RadDiagramToolbox control. It is designed to display multiple galleries of RadDiagramShapes in a single control. Below you can see a snapshot and explanation of the main visual elements of the control. Header - gets or sets an object that represents the RadDiagramToolbox header. HeaderTemplate - gets or sets the DataTemplate used to display the header. Title - gets or sets an object that represents the RadDiagramToolbox title. TitleTemplate - gets or sets the DataTemplate used to display the title of the toolbox. IsOpen - gets or sets a value that indicates whether the groups area of the RadDiagramToolbox control is visible. CloseButtonStyle - gets or sets the style used by the Close button when it is rendered. OpenCloseButtonStyle - gets or sets the style used by the OpenClose button when it is rendered. Items - gets or sets the collection used to generate the content of the RadDiagramToolbox. ItemsSource - gets or sets a business collection used to generate the content of the RadDiagramToolbox. The Diagram Extensions provide a HierarchicalGalleryItemsCollection which is an ObservableCollection of galleries with predefined RadDiagramShapes. You can use it to populate the RadDiagramToolbox.ItemsSource collection with business items. <Viewbox Margin="5 5 5 0"
In case you need to populate a RadDiagramToolbox instance with a custom collection of business items, you will have to create a hierarchical collection of items. 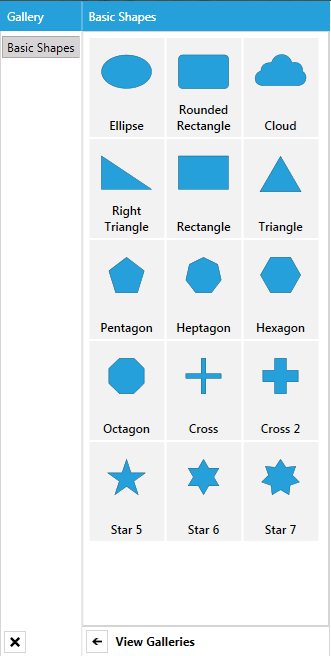 The first-level items of the collection should represent the galleries, whilst the second-level items should describe the shapes within the RadDiagramToolbox. Once the ViewModels are all in place, you can use the MainViewModel as the DataContext of the RadDiagramToolbox and bind its ItemsSource to the Items collection. 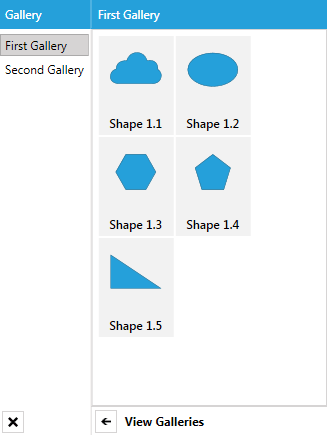 You will also need to define DataTemplates to visualize the MyShape and MyGallery items properly. RadDiagramToolbox supports drag/drop operations out-of-the-box. As soon as a RadDiagramToolboxItem is initialized, it is made draggable through the DragDropManager AllowDrag and AllowCapturedDrag properties which are both set to true. Moreover, the Diagramming Framework internally handles the DragDropManager DragInitialize event to take from the dragged RadDiagramToolboxItem the shape it represents, if sush exists, and serialize its settings. 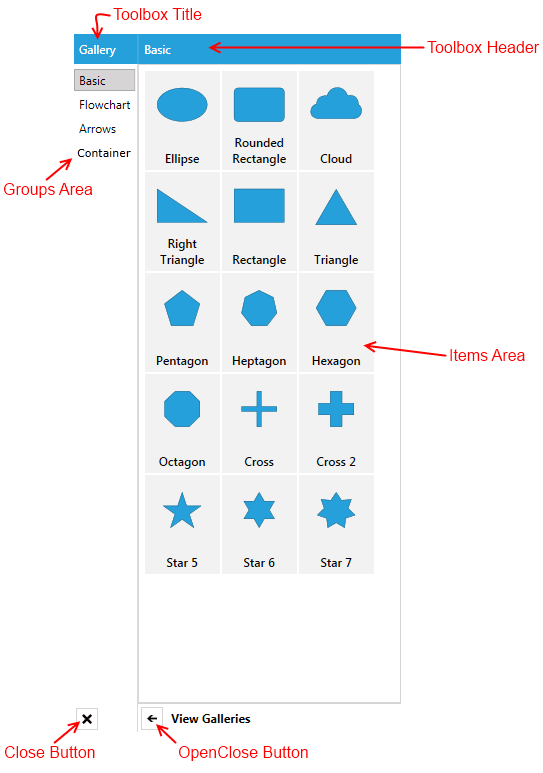 The serialized settings are then saved in a DiagramDropInfo object along with the actual size of the dragged shape. The DiagramDropInfo structure describes a dragged object within a RadDiagram instance. It includes a SerializationInfo property and a Size property – the first one holds the serialized settings of the dragged RadDiagramItem, while the second holds the actual size of the dragged item. Due to this built-in DragDropManager drag implementation, you can easily drag shapes and containers out of a RadDiagramToolbox and drop them onto a diagramming surface. RadDiagram knows how to extract the serialized information out of a DiagramDropInfo object to create a new RadDiagramItem on the surface. However, if you create a custom RadDiagramToolbox populated with a business collection of items, you will have to further configure the drag/drop operation. Please have a look at the How To Drag Items from a Custom Databound DiagramToolbox tutorial for instructions on how to implement such a scenario.